The Moose test, also known as the Elk test, has been used in Sweden for decades to test how a certain vehicle, usually an automobile, acts when avoiding a sudden danger, such as a moose. The test is made on dry pavement. Traffic cones are set up in an S shape to simulate the obstacle, the road and its edges. The car which is going to be tested has one belted person at every available seat and weights in the trunk to achieve maximum load. When the driver comes onto the track, he quickly swerves into the oncoming lane to avoid the object and then immediately swerves back to avoid oncoming traffic. The test is repeated with an increased speed until the car skids down the cones or spins around. This usually happens at speeds of about 45-50 mph (roughly 70-80 km/h) in the best cases. The test became widely known in 1997 when Swedish motor journalists overturned the new Mercedes-Benz A-Class in the moose test, while a Trabant – a much older, and widely mocked car from the former German Democratic Republic – managed it perfectly. The Dacia Logan appeared initially to fail the test, but a later investigation concluded that excessive testing had worn the car’s tires to failure. The name “Moose test” (German “Elchtest”) was invented by German journalists after this event, thinking a test such as this was something needed in Sweden, not in Germany, since there are no moose in Germany. The Swedish journalists have pointed out that such a maneuver can be needed in any country, for example if the car in front of you brakes hard, and you react late. Moose test is also used in a more general sense to refer to any stringent test of the quality of a product. 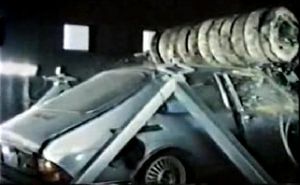 In the case of Saab cars, the ‘elk test’ includes crash testing with a ‘model’ elk, which is made with similar weight, center of gravity and dimensions to a live elk, so that it is a fair simulation. This version of the test came about as a Saab executive was killed in a collision with an elk. As a result, Saabs have a reinforced windscreen (windshield) surround, to prevent an elk’s entry to the passenger compartment, during a collision.